Their performance reviews must have gone really well. 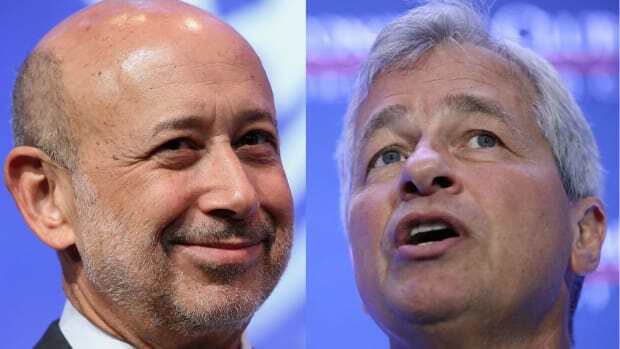 JPMorgan Chase & Co. and Goldman Sachs Group Inc. boosted the cash portion of their leaders’ bonuses for the first time since 2010, as a surge in U.S. bank stocks slows. JPMorgan’s board gave Chairman and Chief Executive Officer Jamie Dimon a $7.4 million cash reward -- his first since 2011 - - while keeping his total pay for 2014 unchanged at $20 million. Goldman Sachs’s board deviated from a four-year practice of paying 30 percent of Chairman and CEO Lloyd C. Blankfein’s bonus in cash. His cash component this time, $7.33 million, accounted for a third of the bonus in his $24 million package.